How is it mid-September already! Time is flying by but the good news is APPLE CIDER has arrived and more apple varieties will be ready for harvest shortly. 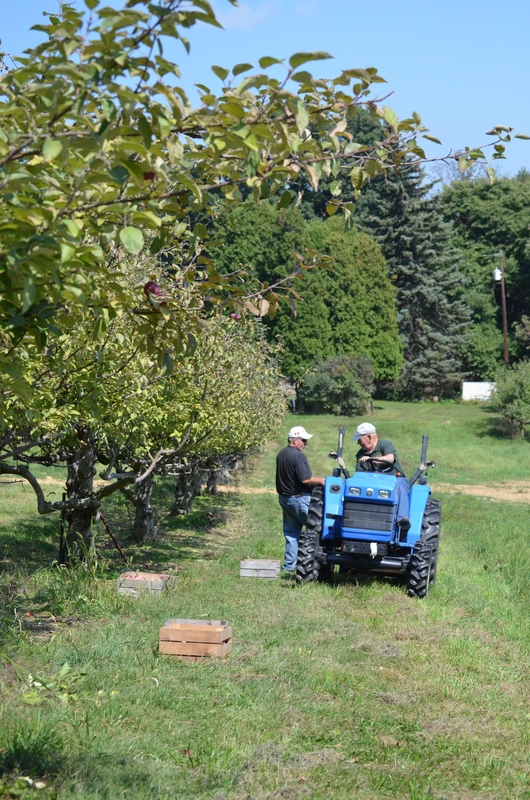 Please call the orchard ahead of your visit to check on availability of your favorite variety and our harvest timeline. Cortland are almost ready for picking. Stay tuned. This week we have GALA, GINGER GOLD and McINTOSH apples. All are great eating apples depending on your tastes. Gala is the sweetest and McIntosh is on the tart side. All would serve you well in baking and sauce-making pursuits, as well! 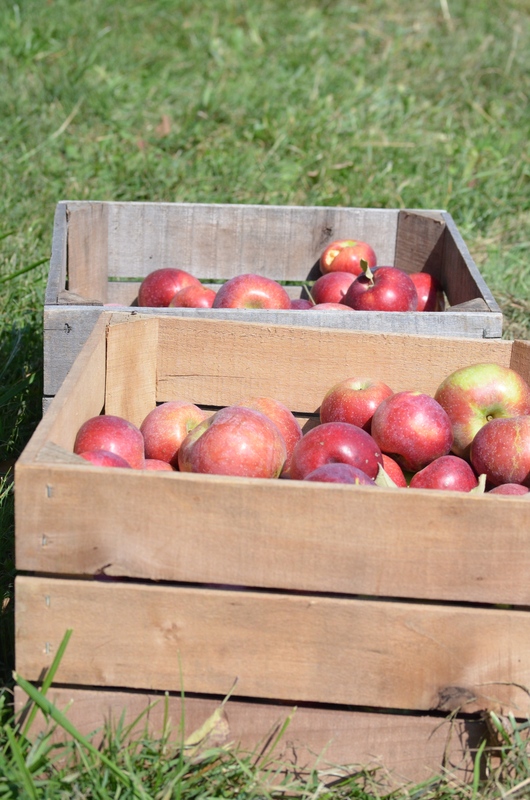 Come out to the orchard this week and sample an apple to see which variety you like best! 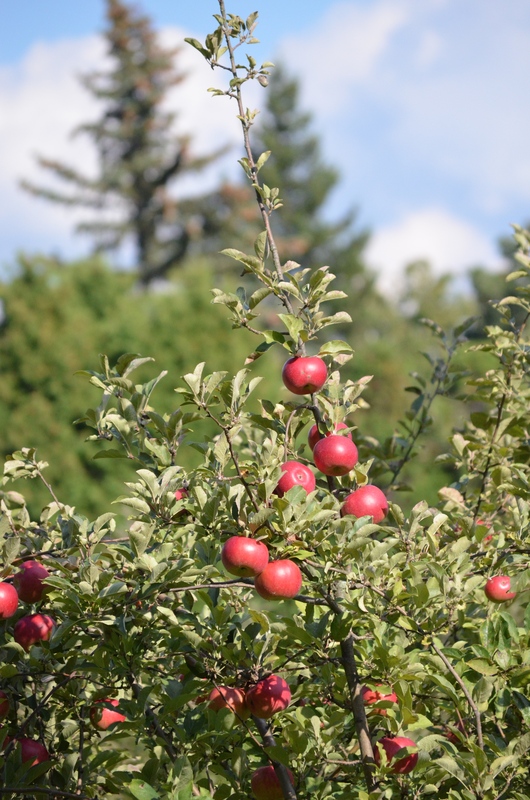 Available at the orchard this week: Gala, Macoun, Spartan & Cortland. One of the most common questions we hear at our apple stand is “What’s the best cooking apple?” Our answer is “Any apple makes for a good cooking apple”! It’s true! With the exception of Red Delicious, which is strictly a snacking apple, any of our varieties would work just fine in your pies, crisps, cobblers, breads and sauces. Sure, there might be a few qualities to consider: A firmer apple will hold its shape better in a pie and a tarter apple might be a better choice in recipes with added sugar. But don’t over think it! In our homes, we simply use what we have on hand – more often than not it’s a mixture of varieties. Keeping that in mind, we’d like to share the “official” Taggart applesauce method! Gather your apples. This batch contained Gala, Macintosh, Ginger Gold, Cortland and Empire (whatever you have on hand). Peel, core and slice – no need to chop or dice! Place in a slow cooker. Heat on high for 4 hours or low for 8 hours. I prefer my sauce with a chunkier, rustic texture – I simply stir the cooked mixture with a spoon and call it a day. Alternatively, you could use a blender for a smoother puree. I typically keep mine sugar free but feel free to add sugar and/or cinnamon to taste. It’s ready to eat, store in the fridge or freeze! Happy first day of fall to you all! The sun is shining this morning at the orchard and the nights are nice and cool. Perfect sleeping weather and perfect conditions for apple ripening! We’re starting out this week with Gala and Spartan varieties. Gala, a sweet apple with unique red-orange color, and Spartan, slightly tart, are great for eating and baking. 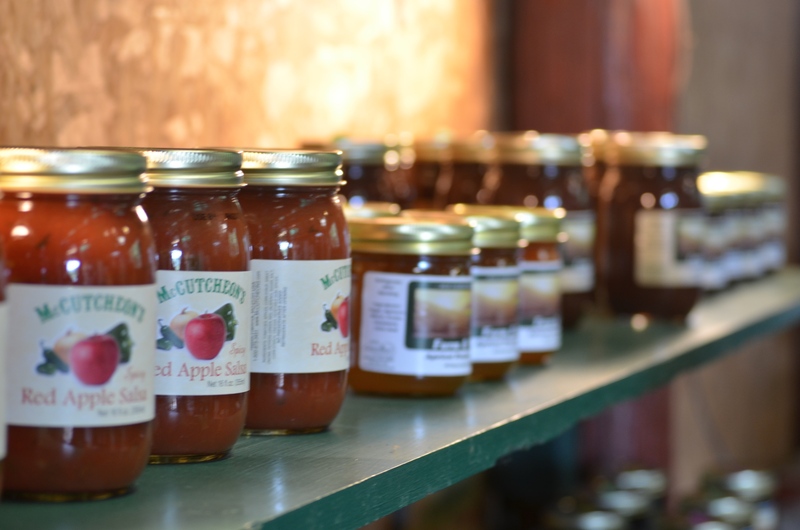 Make sure to check out our Amish-made preserves, snacks, cider and local honey, too. Other varieties, such as Golden/Yellow Delicious, will be coming soon. Check the website/facebook or call ahead for details. We always appreciate a call-ahead for large orders (a bushel or more). 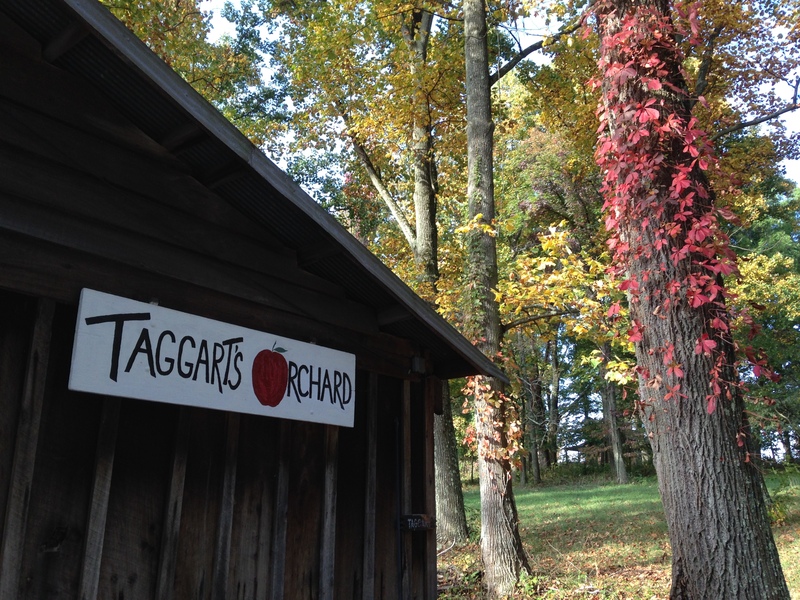 Did you know 2015 is the 30th anniversary of the Taggart’s “apple barn”? The barn itself was constructed by Kermit and his father in the 1950s and housed Angus, rather than apples, for many years. 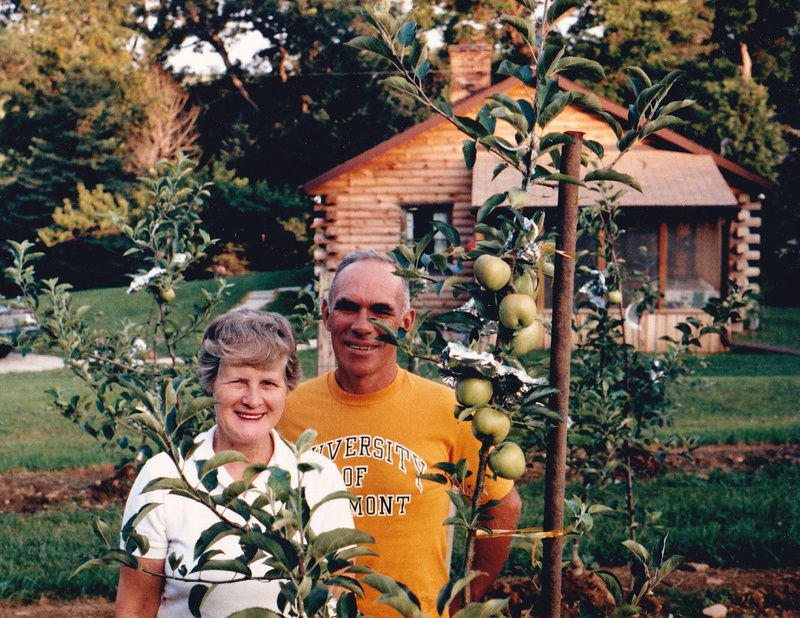 Kermit and Louise returned to the family farm land in 1983 and planted their first orchard. Apple trees require a few years to mature and bear fruit. 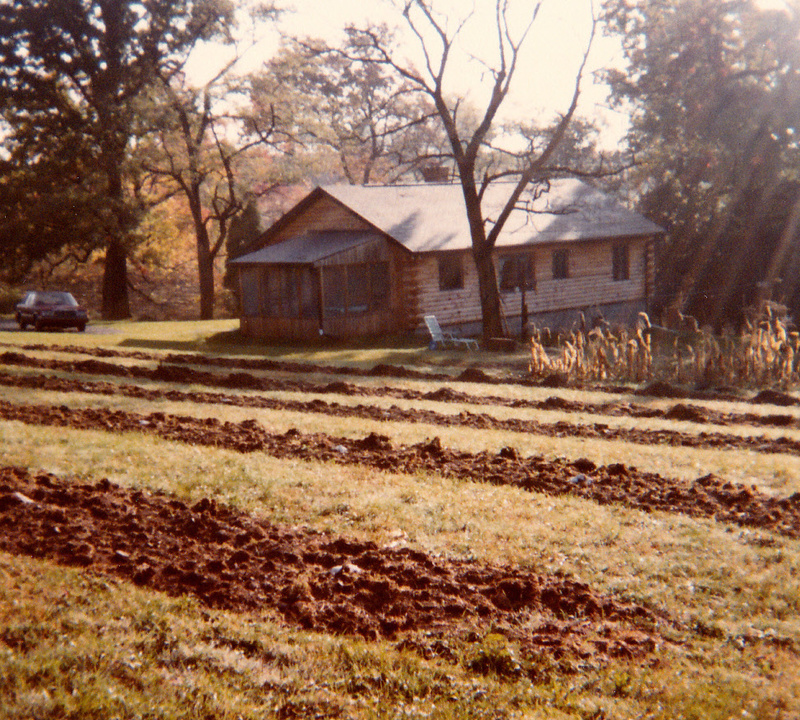 1985 marked the first measurable harvest, and apples were sold in the barn for the first time! Aside from new paint and minor repairs here and there, our barn is very much the same as it was 30 years ago. We’re very proud of our rustic “store front” and family farm, and hope you’ll enjoy a trip out to the country to see us soon! 1985: Kermit & Louise Taggart with their first apple crop. We will be sharing more flashback photos throughout the season, as we celebrate 30 years of sharing our apples with you. Autumn is officially here! It’s time to embrace all things pumpkin spice, hot cider, fresh apple pie and homemade apple sauce (if you haven’t already, that is!). Our apple barn, surrounded by fall color. Apples ripen on the tree. Cider, local honey, jam, peanut brittle, pumpkin and apple butters are also available. We encourage you to call ahead to inquire about up-to-date availability of your favorite variety or if interested in large quantities (bushel or more). Many of our apple varieties will reach their peak over the next few weeks! Sunny days and cool nights have helped the ripening process. Autumn officially begins this week – a perfect time to make a trip out to the orchard! Empire apples fresh off the trees. This weekend we have Gala, McIntosh, Jonagold, Macoun and Empire apples. These are great eating and baking apples – Have a sample and find your favorite. Cider is also available. In addition to apples, we have preserves, apple and pumpkin butter, local honey, peanut brittle, popcorn balls and cider. These make great gifts or treats for the ride back home! Kermit and John load apples on the tractor for washing and sorting. 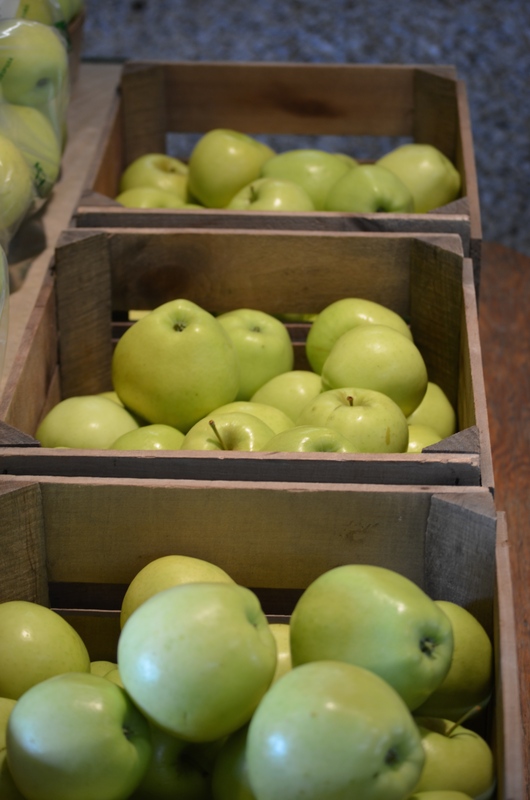 Many folks have been in asking for Yellow (Golden) Delicious – they are coming VERY soon!